We woke up and decided to go to the Belen mercado for breakfast, it was about a 20 minute walk from our hostel, on the way we passed the famous Belen neighbourhood. It is a floating shanty-town with 7000 inhabitants. The colourful houses on stilts are a wonderful sight and in the rainy season these stilts are immersed in water. The inhabitants can only leave their houses by boat and market traders come door to door in their canoes to sell jungle produce. Unfortunately when I was there it was the low season and its dirty, unhealthy and dangerous to walk around so we observed it from a distance. You get street guides offering to take you in but I wouldn’t advise it. The market was fascinating, it was huge and sold everything you could imagine. Every street sold something specific so you had a street of clothes, another of shoes, one of the shaman witch doctors, fruit and veg and meat! These last two were the most interesting streets for me, I had never seen some of this fruit and veg in my life and was so fascinated by the colours and shapes of these different fruits. I bought one of each to taste, the flavours were so foreign to me, I had literally nothing to compare these new flavours to and it was a great food experience! Next stop was the meat and fish street, unfortunately this was where I saw the most animals during my jungle experience…none of which were alive. They had everything from caiman meat, to turtles to fish that I had never seen. I walked up and down taking pictures and asking what fish they were, it was a mixture of fascination and disgust. I could write an entire blog on this particular issue but I won’t because after living with a family in the jungle I realised this was a means of survival for them. There are so many issues to be addressed such as implementing limitations on hunting of particular species but many of these civilisations are even unknown to governments, they are so remote that creating such laws would be useless. For example the family we lived with were allowed to cut down as many trees as they wanted, there were no conservation laws whatsoever even for rare species. Something definitely needs to be done but the issue is very complex. We tried many new foods but I didn’t dare eat the grubs, everyone kept telling me they were delicious with the mango salsa but just looking at them made me want to vomit. Lena said they pop in your mouth like eyeballs and then slimy stuff comes out but they taste good…I often say “No thanks I would rather eat my own eyeballs” but actually..I wouldn’t eat any! We decided on a typical Peruvian breakfast Lena had Ceviche (fish dish cooked in the acid of lemon) and I had Arroz con Pollo (chicken and rice), in Peru you get used to eating dinner for breakfast! Belen market is a must see for anyone in Iquitos, its colourful and full of locals, it doesn’t cater to tourists so you get the real deal! Just make sure you don’t take any valuables, its known for having thieves and is the most dangerous neighbourhood so always be aware of your surroundings and don’t ever look lost! 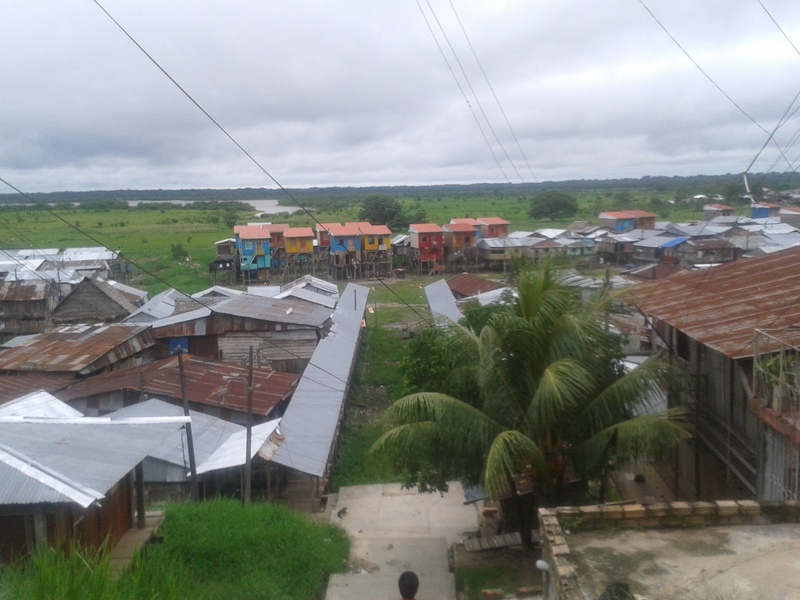 The rest of Iquitos was also a colourful experience, the weather was tropical and the greenery was lush. One day me and Lena tried to get to a lake and the mototaxi took us to a puddle instead…it was across town in the same direction but obviously not the right place. We got off anyway as it was a tiny village that looked really interesting. There were houses scattered around and a few small tiendas, after walking around for a few minutes we had seen it all and decided to head to a tienda (cornershop) to get some drinks and play cards. The owner quickly set up a small table outside with a view of the river and we got some snacks and just sat there chilling for an hour. Passers by were really friendly and it was a cute place. That evening we went for dinner to puerta Bellavista, it is another market except this time where all the fish and meat is you choose yours and they cook it for you on the barbecue! It was where the locals ate and was cheap and delicious. I loved Juanes, it was rice steamed in banana leaves with spices, I ate it everyday that we were there. A typical house in the village we were taken to. By the river in Iquitos there is a lovely malecon, we came here the first night to eat and I loved it. It was like an Amazonian covent garden – bars, restaurants and street performers and people selling random things (mostly jewellery). There was this buzz in the air and I loved the atmosphere. We ate at Dawn on the River restaurant which I would highly recommend, the food was delicious. A Peruvian American fusion of flavours and it really worked, everything was simple but cooked perfectly. While speaking about “must-eats” El Sitio was AMAZING!! Its a restaurant with an array of different skewers – fish, cheese, meat, chicken, veggies – you just pick up whichever ones take your fancy and they are barbecued. A really cute old man grills them for you, originally he used to have a grill on the pavement outside and he did so well that he now had this restaurant which was completely packed and once the skewers are finished its over so get there early to sample the best ones!! If I had found that on the first day I would have eaten there everyday..thats how good! The malecon also had an artisanal market if you turn left from dawn on the amazon, its full of beautiful hand-crafted things many of which are made by Amazonian’s clearly under some kind of influence. The tapestries are created by ladies while drinking Ayahuasca, each piece is unique and intricately woven and the colours are breathtaking. I found out they are actually made in Pucallpa. Iquitos is not the place to go souvenir shopping unless you are buying things made there as it is not accessible by road everything is imported and therefore more expensive, it was one of the most expensive places I visited in Peru. If you are doing jungle tours in Iquitos make sure you research them thoroughly and know which you want to do because the tour vendors will confuse you. They follow you in the streets really trying to persuade you to visit their tour companies and every hostel sells tours to, in fact so do most restaurants and so you can’t escape it. The night we went to book ours we ended up being so confused and annoyed and they are all so desperate for sales they say anything so you don’t even believe them. I was persuaded by a tour, spent 2 hours discussing it and then we decided to just do it and then the guy ends up saying its full. We got so fed up we decided to just forget it all together, I remember being annoyed in India by people selling me stuff but this was on another level. It was literally people fighting over you, telling you not to talk to this tour company or that and it was like you were caught in a tour war. We were walking back to our hostel and we saw this guy on a motorbike who Lena had spoke to a few days ago who had a tour company, he stopped and asked us if we managed to book a tour and we said no so he took us to his office…the tour was very different to what I initially had in mind but we were certainly in for an adventure! We had booked it for two days as the next day we were going to the monkey island, for those of you who have seen this video, you know part four is going to be entertaining.